Category: Sticky, Trading @ Zerodha, Zerodha? Most support queries are repetitive in nature and in fact have answers already available. These answers are spread out across Z-Connect, Varsity, or TradingQ&A, making it not very straightforward for clients to find. Often, queries pertaining to specific aspects of an account (for example, a particular order) do not come with the necessary information (eg: order ID) for our support team to process. This results in a lot of back and forth e-mails significantly delaying query resolution. 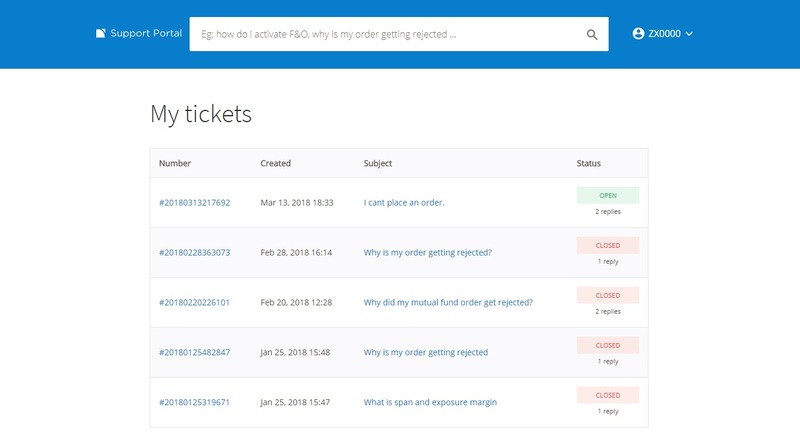 To address this issue, we’ve built an all-new support system – Zerodha Support – a manually curated and actively maintained knowledge-base of information, questions and answers pertaining to all aspects of Zerodha, from account opening to trading. In addition, we’ve focused extensively on making these answers discoverable through an intelligent search system. If you’re still unable to find an answer to your query on the Support Portal, you can create a support ticket and track it right from there. The new ticket interface automatically pulls information from your account (orders, holdings, positions etc.) and let’s you pin point the exact issue while writing your query, saving you significant amounts of time. This is a much better and smooth experience than writing e-mails directly to our support e-mail address. 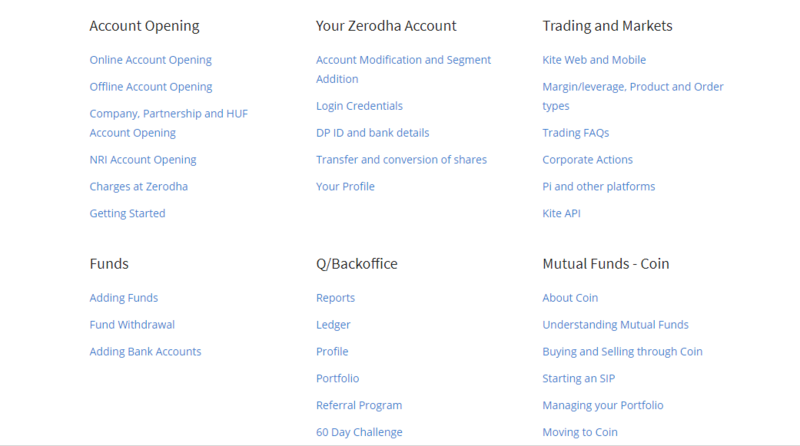 With over 400+ topics across 6 broad categories that are updated regularly, the portal has everything you need to know about trading at Zerodha. We’ve put in a lot of effort to make the content discoverable through an intelligent search system. In the unlikely event that you don’t find a solution to your query, you can create a ticket from a topic specific to your query. Not just that; with the hooks we’ve implemented in the portal you can even select a specific transaction or entry (orders, holdings or positions) that you’re facing an issue with when creating a ticket. 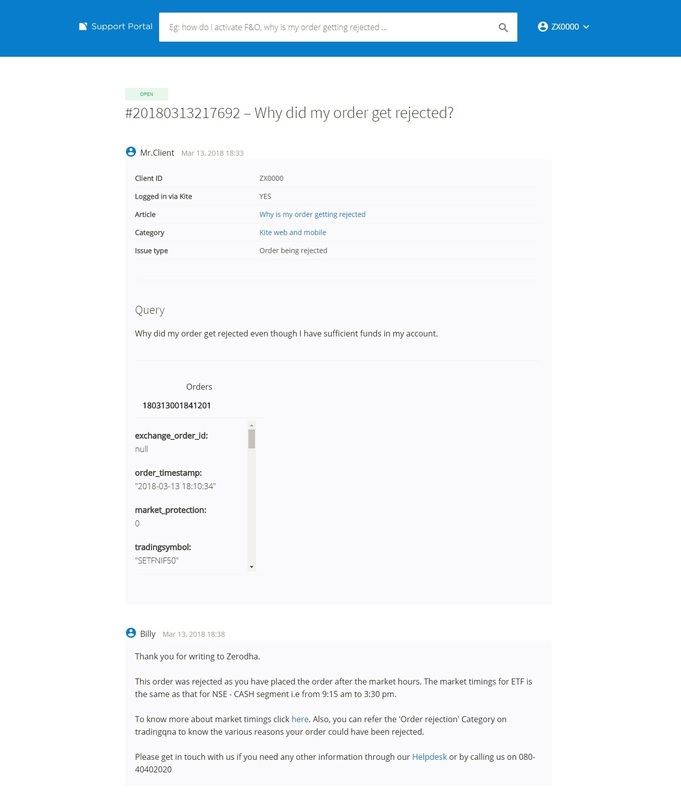 Let’s say for example your order was rejected and you couldn’t find the reason, you can create a ticket by selecting the rejected order as shown in these screenshots. This ensures that your tickets are assigned to the appropriate teams and comes with enough contextual information, thus ensuring a quicker resolution. Select orders, positions or holdings to specify your issue. If you have multiple tickets you can track their progress easily from your dashboard. Track all your tickets from your dashboard. 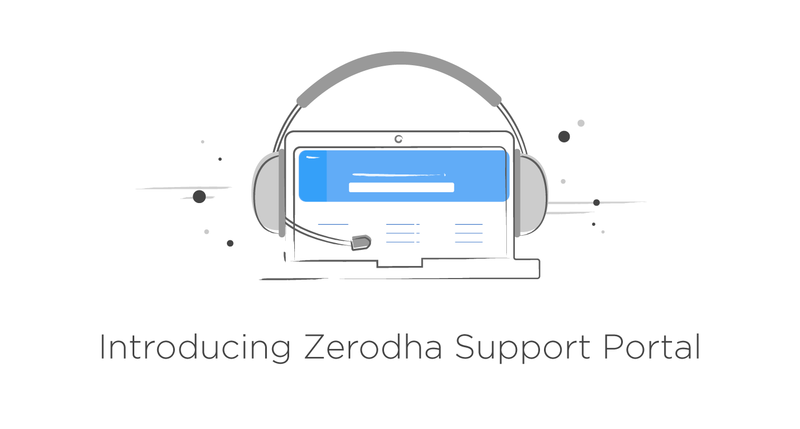 Next time you have a query, instead of sending an email (we will soon stop accepting emails on support[at]zerodha.com) head to the all-new Zerodha Support Portal! GREAT WORK DONE BY ZERODHA. Thank you for sharing the details on new support portal. I have a small request. if you could link Brokerage and Margin calculator on Kite application. It will be really helpful for us while using Kite app on mobile. Good upgrade, How come my ticket was closed after 3 useless replies and the problem still persists ? When checked from a tech background, follow up after fixing the issue seems not so important to the support team. Please do something about it if this comments section is a better way to deal with overlooked tickets. Nithin Sir its too great again ZERODHA provide all types of support for traders, and improving day by day sir i am a commodity trader and i think its time to make a research team for equity or commodity.I know this is hard but as per till today zerodha given best in all things for a trader so in research team provide a way for achieving best results in future. Thanks Zerodha thanks Nithin Sir G.
It really sounds good and should prove to be very effective. I would request the team to introduce an “alarm” facility on the Kite-3 trading platform so that we can get pop-up notifications when the price of a particular stock(s) arrive at a certain price level or about to arrive. Your effort to this effect would be highly appreciated. Hey Vishal, I see that your support ticket was responded to. Please! Add 2H, 3H and 4H Chart in KITE Platform. I can use 4H Chart in Kite but 2H and 3H is not available and just for these Timeframes, I use Sharekhan’s TradeTiger. Why not just create a way to specify CUSTOM TIME in Kite so that chart could be generated on the basis of CUSTOM TIMEFRAME as is in Sharekhan’s TradTiger. Amongst many discount brokers out there…Zerodha is a well known name. Please stop blocking the scripts during live trading hours. Hey Ragul, if you’re talking about out of the money bank nifty strikes, here’s why. I have purchased 10 stocks of HSCL @ 156.50 on 16.03.2018. But till date (21.03.2016) in holdings the average price shows N/A and its value is not included in my total investment amount. please update. Sir kite app achhe se kaam nhi kar rha h.
Pls help kare. Hang ho jata h. Sirf kite app m hi problem h. Baki apps achhe se kaam kar rhe h. Koi connet no dijiye jispe baat karke m apni prblms bta saku. You can contact the support desk on 080-40402020, Inderpal. Tried to call Rachan from last 2 days not picking up the my call.Just sending SMS as busy in meeting.I had just open the account on March 20,2018 and already send the required documents by courier still my account is fully active for call.Please informed me that need done here. Hey Madan. Sorry to hear that. I hope Rachan got in touch with you? services are very poor ,I m unable to open my account , I m calling Naveen v as he was in touch with me last month, but now contact no not available , I m sending mails no response of mails. customer care also un supportive. Hey Manju. Sorry to hear that. I see that your account is already open. For more assistance, you can call our support desk on 080-40402020.
as I mentioned we have done all the excursive but not getting results, Kindly arrange call for support . urgently we want to buy stocks ,but unable to do the same.if you are not having person to call or support us . sorry to say we will open Account with some other facility. I had posted a fund withdrawal request on 23/03/2018. Sent a mail at zerodha support and a ticket was opened. Request did not get processed on Friday or Monday and not even Tuesday. Called several times but only got fake promises from zerodha support team. Such a harassment from zerodha. Abhay, the brokerage calculator only shows brokerage and charges. For margin requirements, check out the margin calculator. I raised a ticket (#20180321775351) on 21st March, 2018 about STT being levied while buying ETFs. I haven’t received any acknowledgement/resolution till now. Request you to look into the issue. “Thank you for writing to Zerodha. It’s been about a month that I raise the ticket. How much time do you need to check? And what do you mean by “if its charged wrongly”? I have reported an issue with your software and the least your team could have done is to properly investigate it. Why would you close the ticket without solving the issue? Created tickets 20180402252775 and 20180403470817. My 20k stuck in because I transferred to the account from tez UPI. I have e given transaction logs and everything and confirmed from hdfc it is credited to zerodha account . But no response on the tickets for two days. Can anyone help me ? 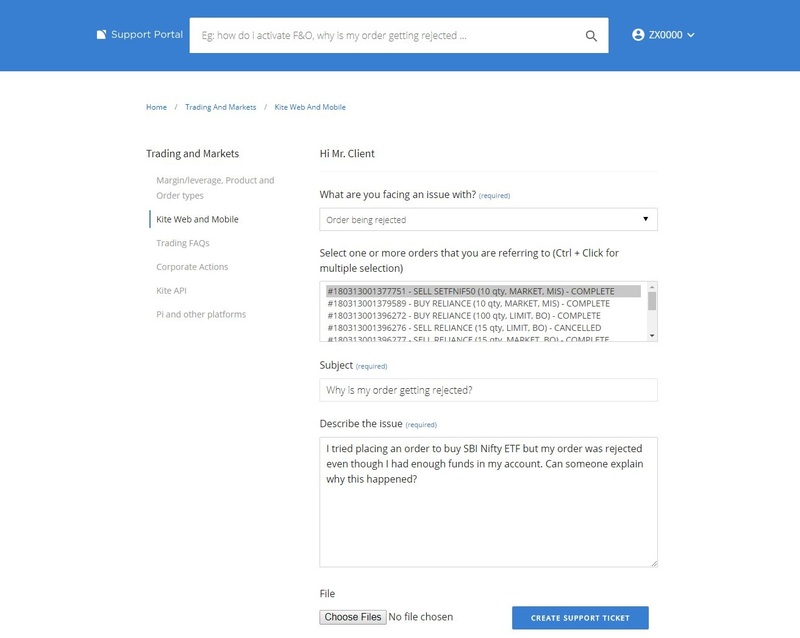 How long will my money be stuck with Zerodha account I just wanted to add it in for trading. Hey Rohit, I believe your transfers have been updated. Please check. Best initiate UPI all transfers from Kite going forward. i had requested for f&o options to be activated. You can call our support desk and ask us to unblock the account. I changed mobile yesterday. Whatever operations I did on Friday r not getting updated in mobile. Can you please be clearer? What exactly is the issue? But till date (13/04/2018) Contract note not received to me on my mail. So please update and send contract note …. In Q-backoffice only contract notes for Eq are available for this year not since 1/4/17 as specified How do I get Contract notes for F&O trades and Eq trades done during FY 17-18? This should be resolved in a couple of days and you’ll be able to download. U are doing good job between 9 am to 5 pm. But Commodities also in your platform. after 5 pm no person will co-operate in commodity trading. U r staff replying commodities are no way connecting to me, it deals by only in Bangalore branch. in that also the system is not responding in proper way. in the night also if one person will co-operates in that segment, 100% U r services will be very great and automatically Ur platform will also bags first place in the country. Please appoint one person to support for commodities in odd hours, especially for new members. This data can be found in the trade book, Ramesh. Is there any technical problem today. I can not log in my account. Due to a connectivity issue, you may face an issue with logging into Kite. We are looking into this and should have this resolved shortly. You can login to Pi. You can call us or write to us in the meanwhile to place orders. Apologies for the inconvenience. I have some queries regarding POA and Nominee forms. Is the costumer help center available on Saturday and Sunday? I am extremely unhappy to mention that the support group has become inefficient and insensitive. Fund transferred late in the night is not updated, in commodity account, causing auto placing of orders, resulting in loss to your customers. Telephone calls are answered with a prerecorded message that the services are not available. Even on the next day the account is yet to be updated. I am seriously worried. Hope you consider support issues related to fund transfers a higher priority. In future trading today I was holding Tata Steel lot which I sell, during selling error occurred and had asked me to retry. I had tried again and sell it. 2 lot have been sold and in my summary -1200 is reflected. Also in fund section exposure and span some amount is reflecting. Please call me and let me know line of action. For trading related queries, best reach us on our support desk. I’m using Zerodha since last 6 months and I’m facing few issues with your technical charts and I’m listing them here for your reference. 1. If we open 2 or 4 charts window in Google Chrome or Firefox it doesn’t display the toolbars for charting options i.e. minutes options, views, displays, studies etc. These option only work in Internet Explorer. Is it possible that you make changes in your software and these options start working in Google Chrome and Firefox as well. 2. Although the above mentioned options work in Internet Explorer but when I want to add some trend line or any other drawing tools in chart it doesn’t allow me to do that because the moment I take my cursor on chart area, it start showing the studies which I’ve added to my charts and it highlights the area infront of those studies and thus my cursor won’t allow me to add trend lines etc. For e.g if some moving averages are included in my chart and I start to draw a trend line it shows the moving average row in chart area and that area gets highlighted. 3. I’ve noticed it numerous times that (in Zerodha Web Kite portal) some candles does not show the entire price action covered by the candle in live charts and once I change it 2-3 times to different time frames than it shows the full price action area covered by it (I’m not talking about gap down and gap up opening). This problem is not there in your PI software. 4. Another issue which I face is that sometimes your chart stops refreshing and then I’ve to refresh them by pressing the refresh option provided in charting software. I wonder why sometime auto refresh option work and another time it won’t. 5. Last issue which I want to highlight is that when I open a technical chart at market open i.e. at 9:15 am and if the chart is set for 3 minute or higher time frames then candles don’t start forming in these times frames instead charts start moving forward with dots. To avoid this I’ve to first open the chart in 1 minute time frame and after 2-3 minutes I change it to the desired time frame. I hope these issues are not faced by me alone and further I would like to apprise you that I don’t have connectivity issues and thus you can’t attribute it to my net connection. Looking forward to the eagerness of your technical team to resolve these issues on priority basis. I hope you’ll not ask me to raise these issues with your support team and if it is to be raised with your support team then I would appreciate if you could directly forward these issues to your support team and it will be taken more seriously if you forward it to your support team. I belive your support ticket has been answered with details on this? This stock isn’t trading currently. Please do reply as i am not satisfied with this. I have submitted all necessary documents on June 21, 2018 for re-opening of demat account with Zerodha. I was told that the account was active. When I took the CMR copy to transfer my shares from another demat account, I found that my account status is closed – raised this issue on July 11. Today is July 13 and still no closure on the issue. I’ve been calling the customer care for the past 3 days and everyday I am being promised that it would be resolved on that particular day. When will it be resolved? Hoping that at least through this comment my issue would be resolved. Hello nithin sir I just want to know that the equity or f&o per executed order charge flat 20 RS by zerodha but if I buy 10000 shares and the software divide that shares by 4 part 2500+2500+2500+2500 so it’s brokerage still 20 or I have to pay 20+20+20+20=80 Rupees brokerage.. I really thought a lot before opening a HUF account in zerodha and then I had faced so many issues while opening as well. Hardly anyone in zerodha is trained to handle HUF account opening. All possible mis-information is provided and then so many follow-ups to know the status. Now I tried to activate F&O trading in the same account, and yet again the same problem. And learning from past experience i thought it is better to visit your office and do all the required formalities and 2 hours after reaching home (travelling 12kms in Bangalore) i get a mail that my application is rejected as I was misinformed. And i have to go through all the same hassle just so that i can trade in my account. Now i should seriously reconsider my option to move to either Upstox or tradejini. Just for your information, i had got at least 3 more accounts as i referred my colleagues. This great reliance on technology at the exclusion of human interface even in crucial area of support can backfire at times. I can understand that FAQs and Automated Help can take care of “routine” queries but my experience shows where Zerodha has failed in its duties to take care of its clients online. I transferred shares from another brokerage house to Zerodha in Nov 2017. This included shares that were bought many years ago in the other brokerage. I then updated manually the buy date and price via discrepant share entry. These shares were sold in March 2018 through my Zerodha account. But the transaction is not reflected as Long Term Capital gain/loss as it should be from its purchase and sale dates in my Tax P&L report. It’s been more than 48 hours since I raised multiple tickets about it with the words URGENT as I need it to finish my tax return but to deaf ears. When I called helpline number, the person could only ask me to raise a support ticket after listening to my explanation as written above. So either by calling or raising a ticket no human being can help me with my problem. In my conversations couple of times, they have admitted problems with your backoffice software and promised that it is being updated “soon” but that “soon” has still not come after several months. Sorry to put a spoke in your wheel but it’s time to stop all this self-congratulatory business with superduper technology if it cannot provide the required help to clients as and when needed, and in the timeframe required. (1) If you sign up for no frills brokerage, this is what one ends up with! (2) Reliance on technology which is not fully matured or still evolving has its unintended consequences. (3) Even in trading software Kite, I have had stoplosses which were rs.15 above current price gone in a microsecond (stock was DRL). The huge price move was not shown on any Zerodha chart or on Google or any other chart I checked. Even NSE didn’t record it as day’s high. The prices/charts only got updated at the EOD. Raising a query with SEBI is like dealing with a dumbass government dept. that only wants you to fill out forms and stuff. Then they forward your complaint to the brokerage house. What if it is the exchange that is at fault? How many places can one file a complaint? Zerodha standard reply was that not all price points can be shown and a valid response at least. So in all likelihood someone at NSE could be playing with our stoplosses but us hapless clients have no recourse. All the more reason to stay away from costly futures. (4) If slightly higher brokerage is deterring one to enter the stock market then our trading plan is not correct. Time to seriously rethink your trading strategies. Better stick to delivery based trading only. I am not able to login into my account an error is being displayed ‘” user blocked contact system administrator”. I have paid Rs.500/- during opening of account in your website through wallet (Airtel Payment Bank wallet). Your gateway partner i.e. Rezorpay confirm me that payment was successful. Hi Debjit, have you completed the e-sign process using Aadhaar? I bought 194 shares of TVS motors in multiple trades over a period from Sept 17 to Aug 18. Recently I sold 65 shares at average price of 553.23 in Aug 18. As it follows FIFO rule, my current holdings of 129 share has average buying price of 558.44, which is correctly being shown in my holdings. The average buying price of sold 65 shares was 646.55, and hence my total realized loss is approximately 6000. But Tax P&L report of FY 18-19 is showing showing the average buying price for sold shares as 594 and hence realized loss only 3000 approx. No loss is shown in Tax P&L report of FY 17-18. Why this mismatch is there and which report I need to claim loss of 6k. Hi Abhimanyu, BO is enabled for everyone by default. What is the error you’re seeing? Hi Sanket, this has been explained here. I have created a ticket on Aug 21, 2018 16:48. Until now no feedback. Issue : On august 16th i sold 710 shares of “X” company @ Rs 48.20.But in the P&L report it is appearing only amount for sold shares of 375 qty. Can you please support me. Is it possible to place stop loss and target at a time in single sell order for normal option sell call? No technology is good if the willingness to resolve customer issues is missing. struggling with opening account on Zerodha. Paid fee and completed formalities two weeks back however my account is still not active. No one from Zerodha customer care is ready to help. I even tweeted and logged a support ticket but sad to see Zerodha not paying any heed to the issue. At least return me my money. Best raise a ticket on our support portal. You can update your mobile number from the profile section of Q. This is on our list of things to do, Felix, but will take some time. It’s very sad to share here regarding my sales manager, she is not responding over any call & messages, hope for good co-operation. or can you please change my sales manager. I’ve very bad experience with Zerodha Support. They’re not providing support in timely manner and nobody is willing to resolve the customer issues. I’ve opened support ticket 4 months back and have not received any solution yet. They keep waiting 15-20 days each time I comment on the ticket. Nobody is willing to work on it. Also they’ve closed the ticket multiple times saying that they’ve reported the issue to their developer team. But still the issue is not resolved, so I had to re-open the ticket again and again. I tried to call the supprot number and talked with the representative and their senior and they’ve no knowledge about thier systems and they keep telling the same instead resolving the issue. What is the purpose of all this “Zerodha’s new support portal” if you’re not resolving the issues effectively? I have paid my opening fee of rs 300 and recived the payment recived email . but i m still stuck on the second page and it says “Your payment could not be captured. Please try later” . This issue is addressed and we see you have proceeded ahead. You can check out all this data on Console, the backoffice. For client ID: RM0279, though F&O segment is active as shown in the client profile, any order related to NFO segment is rejected showing the reason “this segment is not active”. The matter has been raised to support.zerodha portal, yields no result and also no response. I am an existing customer. Customer ID is QE2165. Currently I am having only equity account. To open the commodity account I have completed the necessary procedure through online. And then I sent the necessary documents (ECN, Bank Statements, POA) through Blue Dart Courier at least 10 – 12 days earlier. But still I am waiting for login ID and password.